Have a look at the stunningly beautiful and eerie photos of a volcano in Russia, Kamchatka. Some time ago I mentioned keeping an eye out for undersea volcanic activity which will present itself (in various places across the globe - but I may have mentioned the Pacific specifically). See the below mentioned report regarding such a thing occurring in the pacific near Tonga. I have felt for a long time now that with all of the major activity in the plates around the Pacific, that along and near those edges there may be emergent or regenerated volcanic activity. The energy (including magma deep plumes) may also come to emerge in other regions of the Pacific, which have been silent or their position may not be currently on record as potential 'weak spot' for the potential of emergent activity. Volcano Live - with John Seach is another excellent site. Kate Humble Into The Volcano is worth watching if you can get your hands on it. Not going to be as technical as we like, but still interesting and some great shots done with drones which I haven't seen much of before. 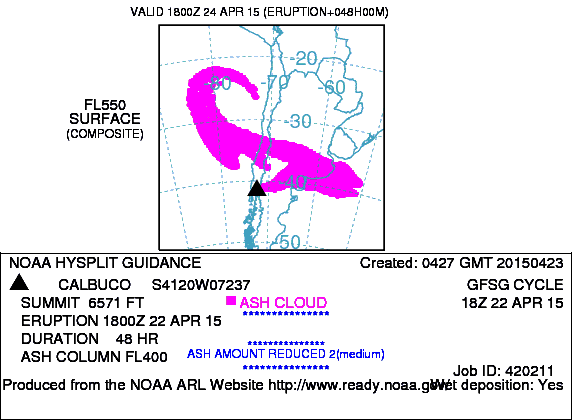 Calbuco volcano has blown and the eruption column has blown through 40K feet. It is located in southern Chile, 11 km south of Lake Languished, and 30 km NE of Puerto Mont. Yeah it's definitely a spectacular eruption, that's for sure! Haven't seen much night-time footage of volcanic lightning within the ash cloud yet but heard the tail end of some on the news being captured. The 1st image below shows the latest ash concentrations as detected by multiple satellite sensors via the Support to Aviation Control Service at 12:34pm AEST. 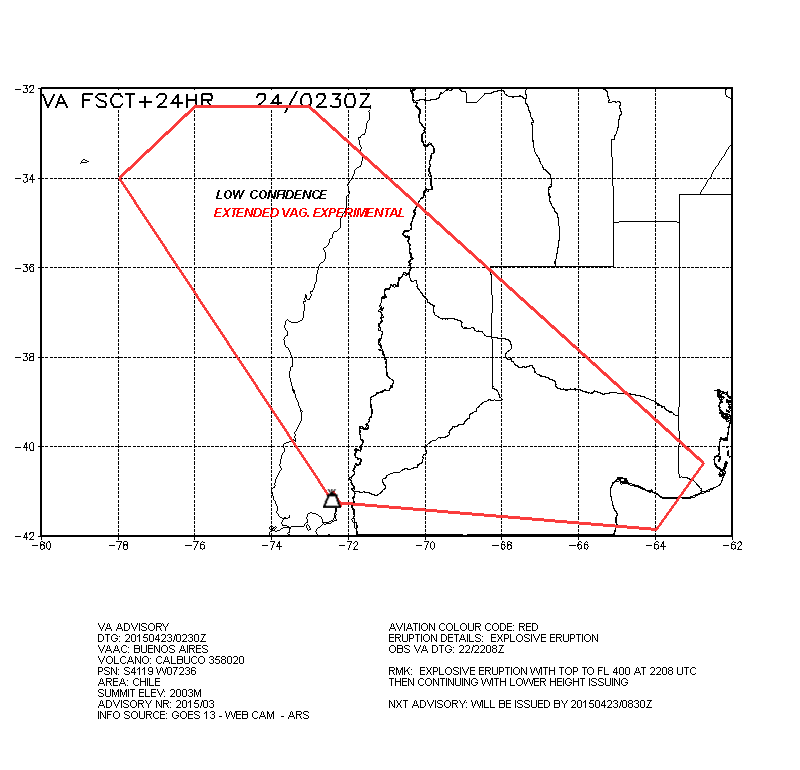 The 2nd image below is the experimental version of the official ash advisory issued by the Buenos Aires Volcanic Ash Advisory Centre which goes out to 12:30pm Fri (the red outline indicates the potential outer edges of the volcanic ash). Culbuco eruption is reported on ABC tonite,to have reached 20 Km(may need verification?) which puts the plume well into the stratosphere. The effect of volcanic eruptions on stratosphere and climate in general seems to involve the injection of sulphur compounds, dust particles and perhaps other gases. A lot depends on the volume of material getting injected into the stratosphere and in the case of dust -particle size. Also the effects may lag for quite some months. It’ll be interesting to see what happens in the next little while - if Calbuco keeps erupting to get a handle on the volume of material thats getting pumped at this level - it may not need to reach the proportions of Pinatubo to have an effect because it has clearly breached the tropopause from it’s position >40 south. Only a small proportion of eruptions manage to do this. It will be very interesting to see any future effects on the climate from this one. From the footage I have seen it appears as though it is pumping a LOT of particulate matter into the air so it should manage to cover a large area of the southern hemisphere. One of the reasons why I followed volcanos so keenly was because of the correlation between volcanic events and El Nino. So it will also be interesting to see what happens to the Pacific ENSO situation where we are hovering at the start of an El Nino. It may be that, unlike the two preceding La Nada years, this event will push the Pacific into a full blown Nino. Here is the imaing of the SO2 plume starting to spread. Excellent source of sat pics. http://www.fvalk.com/day_image.htm. Permission to use in posting required-details on website. 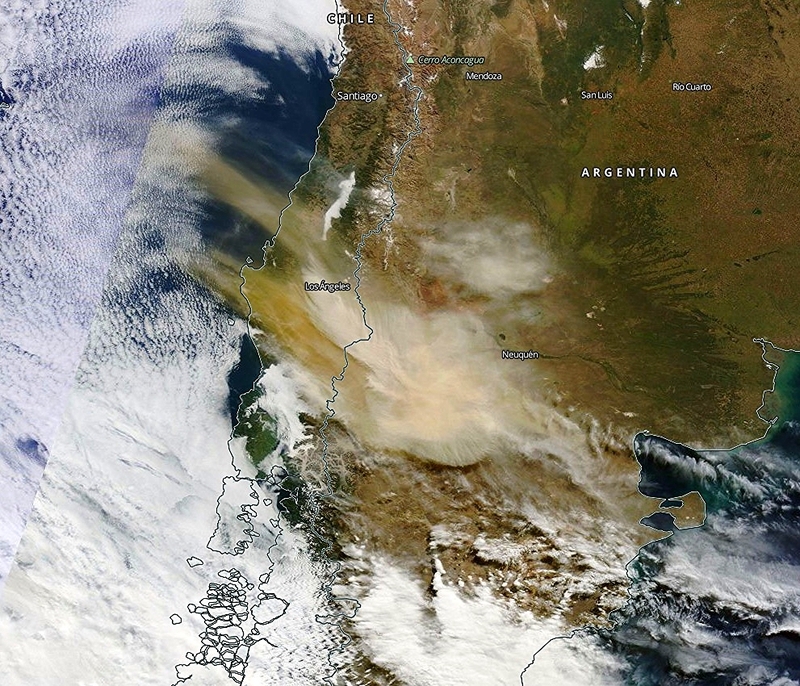 Below is yesterday's spectacular imagery from NASA's Terra and Aqua satellites clearly showing the ash plume. Spectacular Ken. Certainly gives a great perspective of extent. Looks like a demarcation line separating the brown tint speckled cloud from the whiter. Artefact of imaging? Sure does snowbaby. And the line is just the boundary of the composite images from the Terra and Aqua satellites being merged (but due to differences in orbital swaths, they often don't line up perfectly). What is your opinion on future (next few thousand years) of Australia ever seeing volcanic activity. Areas such as western Victoria as an example. That's a great question and if I was to give you my opinion, I'd say that there is a good chance of some activity occurring in the next 2000 years. But....we may see some very minor niggles sooner than that. With the incredible number of volcanoes going off around the world in the current time/s, the percentage chance of Australia, possibly in our volcanic regions, has risen by a small percentage. (Remember; this is just my amateur opinion). In my 'books', no volcano is extinct. Every recognized volcanic mound, mountain on land or under the sea has had varying degrees of magmatic pressure in the past to have created these formations in the first place. It is a matter of time before some of (or many) these 'weak spots' could reactivate....or new presentations of weak spots in the earth's crust (or in plate edge regions) may occur. That's just going on the large number of volcanic activity on the planet atm., and what has occurred as volatile times in the past (even before 'modern' man kept records). 'we' (man and science) can. "Australia: The Land Where Time Began A biography of the Australian continent "
We may see what may be some harmonic tremors in the future (when I don't know)....some activity on the seimo's in the past in our (SA and VIC regions) have displayed what looked like a smidgen of harmonic tremors - BUT - my observation may have been very, very wrong folks. That's a great question and if I was to give you my opinion, I'd say that there is a good chance of some activity occurring in the next 2000 years. But....we may see some very minor niggles sooner than that. The reason I ask is that 20 years ago I visited that western Vic area and was amazed at how recent some of the geology and landscape looked. I suspect that the last eruptions 4-5k years ago were no random dates. That coincides too much with the flooding of Bass Strait after the last ice age. Love et. al. (2004) have suggested that they may be generically related to the volcanoes in the area. I can't help but think that volcanic activity, even very, very minor in size and type, has occurred later than the 5000 or so years currently thought to be the last notable volcano activity in Victoria/South Australia (and perhaps even elsewhere in Australia). Regarding Bass Strait, we used to have a house on Philip Island and would travel all over the place, photographing scenery, and I always had a strong feeling about the volcanic connection with the Strait, the islands and the vast regions near San Remo and even further SE to towards Wilson's Prom. I am still drawn to these regions (particularly near San Remo) and may move back down that way - amongst the rolling mounds/hills down there. I was always fascinated with the land formations/geology down there. Wifey took me along to see san andreas movie last night. Realism was never going to be a strength but effects were. Two highlights , first was seeing s waves rolling through san fran flipping the entire bay area about 30 to 40ft up each wave ( outstanding that ) , the 2nd was the actress who plays the daughter , not sure who she is but oh boy , she gave me an M5.